(CNN) -- Lance Armstrong's Tour de France hopes have not been affected by the fractured collarbone he sustained in the Vuelta Castilla y Leon on Monday, according to Astana team manager Johan Bruyneel. Armstrong remains on course to compete for an eighth Tour de France title despite breaking his collarbone. 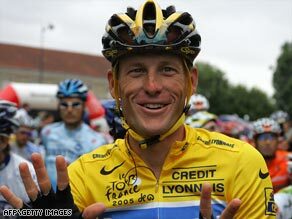 Armstrong, 37, fell heavily on day one of the five-day race in Spain and will fly to the United States to undergo surgery. The American could miss the Giro d'Italia, which takes place from May 9-31, but he will be fit in time for July's Tour de France, a race he won seven times before retiring in 2005. Bruyneel has played down the gravity of Armstrong's injury and insists it will have no bearing on his Tour ambitions. "Honestly, if I could choose one bone to break, it would be the collarbone," the Belgian, a former cyclist and Tour de France stage winner in 1995, told L'Equipe newspaper. "It happened to me twice as a rider. You come back from it fine. It isn't the end of the world or the end of his career, as the rumor has gone in Spain and France. "He will not give up. Worse things have happened to him. A broken collarbone in March changes nothing for the Tour de France in July." However, Bruyneel admitted Armstrong's chances of featuring in the Giro are now in doubt, although Astana are not yet ready to modify his racing program until there is an update on his condition. Armstrong fell as he tried to avoid an accident about 20 miles from the finish in Baltanas but Bruyneel insists the American is still comfortable in the saddle, despite his three-and-a-half-year break from the sport. "He isn't more fearful than any other rider. He is just trying to avoid danger. But it's true that the fear factor increases as a rider gets older," added Bruyneel.